Definition at line 84 of file llmaterialtable.h. Definition at line 44 of file llmaterialtable.cpp. Definition at line 48 of file llmaterialtable.cpp. Definition at line 53 of file llmaterialtable.cpp. References LLLinkedList< DATA_TYPE >::deleteAllData(), mCollisionSoundMatrix, mMaterialInfoList, mRollingSoundMatrix, mSlidingSoundMatrix, and NULL. Definition at line 284 of file llmaterialtable.cpp. References LLLinkedList< DATA_TYPE >::addDataAtEnd(), FALSE, mMaterialInfoList, and TRUE. Definition at line 298 of file llmaterialtable.cpp. References LL_MCODE_END, mCollisionSoundMatrix, and TRUE. Definition at line 401 of file llmaterialtable.cpp. References FALSE, LLLinkedList< DATA_TYPE >::getFirstData(), LLLinkedList< DATA_TYPE >::getNextData(), LLMaterialInfo::mDamageModifier, LLMaterialInfo::mEPModifier, LLMaterialInfo::mHPModifier, mMaterialInfoList, LLMaterialInfo::mMCode, NULL, and TRUE. Definition at line 353 of file llmaterialtable.cpp. References FALSE, LLLinkedList< DATA_TYPE >::getFirstData(), LLLinkedList< DATA_TYPE >::getNextData(), LLMaterialInfo::mDensity, mMaterialInfoList, LLMaterialInfo::mMCode, NULL, and TRUE. Definition at line 385 of file llmaterialtable.cpp. References FALSE, LLLinkedList< DATA_TYPE >::getFirstData(), LLLinkedList< DATA_TYPE >::getNextData(), LLMaterialInfo::mFriction, mMaterialInfoList, LLMaterialInfo::mMCode, NULL, and TRUE. Definition at line 369 of file llmaterialtable.cpp. References FALSE, LLLinkedList< DATA_TYPE >::getFirstData(), LLLinkedList< DATA_TYPE >::getNextData(), mMaterialInfoList, LLMaterialInfo::mMCode, LLMaterialInfo::mRestitution, NULL, and TRUE. Definition at line 324 of file llmaterialtable.cpp. References LL_MCODE_END, mRollingSoundMatrix, and TRUE. Definition at line 337 of file llmaterialtable.cpp. References FALSE, LLLinkedList< DATA_TYPE >::getFirstData(), LLLinkedList< DATA_TYPE >::getNextData(), mMaterialInfoList, LLMaterialInfo::mMCode, LLMaterialInfo::mShatterSoundID, NULL, and TRUE. Definition at line 311 of file llmaterialtable.cpp. References LL_MCODE_END, mSlidingSoundMatrix, and TRUE. Definition at line 555 of file llmaterialtable.cpp. Definition at line 487 of file llmaterialtable.cpp. References LL_MCODE_END, LL_MCODE_MASK, mCollisionSoundMatrix, and SND_NULL. Definition at line 634 of file llmaterialtable.cpp. References LLLinkedList< DATA_TYPE >::getFirstData(), LLLinkedList< DATA_TYPE >::getNextData(), LL_MCODE_MASK, LLMaterialInfo::mDamageModifier, mMaterialInfoList, LLMaterialInfo::mMCode, and NULL. Definition at line 435 of file llmaterialtable.cpp. References LLLinkedList< DATA_TYPE >::getFirstData(), LLLinkedList< DATA_TYPE >::getNextData(), LL_MCODE_MASK, LLMaterialInfo::mDefaultTextureID, mMaterialInfoList, LLMaterialInfo::mMCode, LLUUID::null, and NULL. Definition at line 419 of file llmaterialtable.cpp. References LLLinkedList< DATA_TYPE >::getFirstData(), LLLinkedList< DATA_TYPE >::getNextData(), LLMaterialInfo::mDefaultTextureID, mMaterialInfoList, LLMaterialInfo::mName, LLUUID::null, and NULL. Definition at line 570 of file llmaterialtable.cpp. References LLLinkedList< DATA_TYPE >::getFirstData(), LLLinkedList< DATA_TYPE >::getNextData(), LL_MCODE_MASK, LLMaterialInfo::mDensity, mMaterialInfoList, LLMaterialInfo::mMCode, and NULL. Definition at line 650 of file llmaterialtable.cpp. References LLLinkedList< DATA_TYPE >::getFirstData(), LLLinkedList< DATA_TYPE >::getNextData(), LL_MCODE_MASK, LLMaterialInfo::mEPModifier, mMaterialInfoList, LLMaterialInfo::mMCode, and NULL. Definition at line 602 of file llmaterialtable.cpp. References DEFAULT_FRICTION, LLLinkedList< DATA_TYPE >::getFirstData(), LLLinkedList< DATA_TYPE >::getNextData(), LL_MCODE_MASK, LLMaterialInfo::mFriction, mMaterialInfoList, LLMaterialInfo::mMCode, and NULL. Definition at line 562 of file llmaterialtable.cpp. Definition at line 534 of file llmaterialtable.cpp. Definition at line 548 of file llmaterialtable.cpp. Definition at line 541 of file llmaterialtable.cpp. Definition at line 618 of file llmaterialtable.cpp. References LLLinkedList< DATA_TYPE >::getFirstData(), LLLinkedList< DATA_TYPE >::getNextData(), LL_MCODE_MASK, LLMaterialInfo::mHPModifier, mMaterialInfoList, LLMaterialInfo::mMCode, and NULL. Definition at line 453 of file llmaterialtable.cpp. References LLLinkedList< DATA_TYPE >::getFirstData(), LLLinkedList< DATA_TYPE >::getNextData(), mMaterialInfoList, LLMaterialInfo::mMCode, LLMaterialInfo::mName, and NULL. Definition at line 469 of file llmaterialtable.cpp. References LLLinkedList< DATA_TYPE >::getFirstData(), LLLinkedList< DATA_TYPE >::getNextData(), LL_MCODE_MASK, mMaterialInfoList, LLMaterialInfo::mMCode, LLMaterialInfo::mName, and NULL. Definition at line 586 of file llmaterialtable.cpp. References DEFAULT_RESTITUTION, LLLinkedList< DATA_TYPE >::getFirstData(), LLLinkedList< DATA_TYPE >::getNextData(), LL_MCODE_MASK, mMaterialInfoList, LLMaterialInfo::mMCode, LLMaterialInfo::mRestitution, and NULL. Definition at line 519 of file llmaterialtable.cpp. References LL_MCODE_END, LL_MCODE_MASK, mRollingSoundMatrix, and SND_NULL. Definition at line 666 of file llmaterialtable.cpp. References LLLinkedList< DATA_TYPE >::getFirstData(), LLLinkedList< DATA_TYPE >::getNextData(), LL_MCODE_MASK, mMaterialInfoList, LLMaterialInfo::mMCode, LLMaterialInfo::mShatterSoundID, NULL, and SND_NULL. Definition at line 504 of file llmaterialtable.cpp. References LL_MCODE_END, LL_MCODE_MASK, mSlidingSoundMatrix, and SND_NULL. Definition at line 76 of file llmaterialtable.cpp. References add(), addCollisionSound(), addDamageAndEnergy(), addDensity(), addFriction(), addRestitution(), addRollingSound(), addShatterSound(), addSlidingSound(), f, LL_DEFAULT_FLESH_UUID, LL_DEFAULT_GLASS_UUID, LL_DEFAULT_LIGHT_UUID, LL_DEFAULT_METAL_UUID, LL_DEFAULT_PLASTIC_UUID, LL_DEFAULT_RUBBER_UUID, LL_DEFAULT_STONE_UUID, LL_DEFAULT_WOOD_UUID, LL_MCODE_END, LL_MCODE_FLESH, LL_MCODE_GLASS, LL_MCODE_LIGHT, LL_MCODE_METAL, LL_MCODE_PLASTIC, LL_MCODE_RUBBER, LL_MCODE_STONE, LL_MCODE_WOOD, mCollisionSoundMatrix, mRollingSoundMatrix, mSlidingSoundMatrix, SND_FLESH_FLESH, SND_FLESH_PLASTIC, SND_FLESH_RUBBER, SND_GLASS_FLESH, SND_GLASS_GLASS, SND_GLASS_PLASTIC, SND_GLASS_RUBBER, SND_GLASS_WOOD, SND_METAL_FLESH, SND_METAL_GLASS, SND_METAL_METAL, SND_METAL_PLASTIC, SND_METAL_RUBBER, SND_METAL_WOOD, SND_PLASTIC_PLASTIC, SND_ROLL_FLESH_PLASTIC, SND_ROLL_GLASS_WOOD, SND_ROLL_METAL_GLASS, SND_ROLL_METAL_WOOD, SND_ROLL_PLASTIC_PLASTIC, SND_ROLL_STONE_PLASTIC, SND_ROLL_STONE_STONE, SND_ROLL_STONE_WOOD, SND_ROLL_WOOD_FLESH, SND_ROLL_WOOD_PLASTIC, SND_ROLL_WOOD_WOOD, SND_RUBBER_PLASTIC, SND_RUBBER_RUBBER, SND_SLIDE_FLESH_FLESH, SND_SLIDE_METAL_FLESH, SND_SLIDE_METAL_GLASS, SND_SLIDE_METAL_METAL, SND_SLIDE_METAL_RUBBER, SND_SLIDE_METAL_WOOD, SND_SLIDE_RUBBER_PLASTIC, SND_SLIDE_STONE_PLASTIC, SND_SLIDE_STONE_RUBBER, SND_SLIDE_STONE_STONE, SND_SLIDE_STONE_STONE_01, SND_SLIDE_STONE_WOOD, SND_SLIDE_WOOD_FLESH, SND_SLIDE_WOOD_PLASTIC, SND_SLIDE_WOOD_WOOD, SND_STONE_FLESH, SND_STONE_GLASS, SND_STONE_METAL, SND_STONE_PLASTIC, SND_STONE_RUBBER, SND_STONE_STONE, SND_STONE_WOOD, SND_WOOD_FLESH, SND_WOOD_PLASTIC, SND_WOOD_RUBBER, and SND_WOOD_WOOD. Definition at line 135 of file llmaterialtable.h. Referenced by LLPanelObject::getState(), LLPanelObject::onCommitMaterial(), and LLPanelObject::postBuild(). Definition at line 92 of file llmaterialtable.h. Definition at line 93 of file llmaterialtable.h. Definition at line 88 of file llmaterialtable.h. 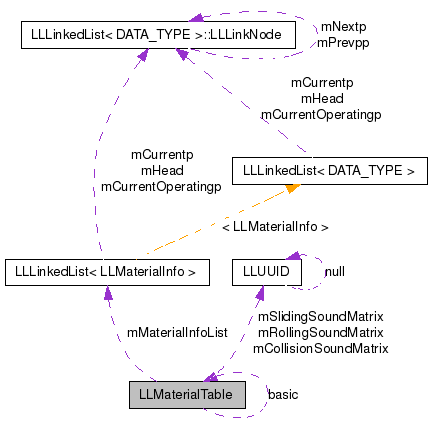 Referenced by addCollisionSound(), getCollisionSoundUUID(), initBasicTable(), and ~LLMaterialTable(). Definition at line 87 of file llmaterialtable.h. Referenced by add(), addDamageAndEnergy(), addDensity(), addFriction(), addRestitution(), addShatterSound(), getDamageMod(), getDefaultTextureID(), getDensity(), getEPMod(), getFriction(), getHPMod(), getMCode(), getName(), getRestitution(), getShatterSoundUUID(), LLPanelObject::postBuild(), and ~LLMaterialTable(). Definition at line 90 of file llmaterialtable.h. Referenced by addRollingSound(), getRollingSoundUUID(), initBasicTable(), and ~LLMaterialTable(). Definition at line 89 of file llmaterialtable.h. Referenced by addSlidingSound(), getSlidingSoundUUID(), initBasicTable(), and ~LLMaterialTable().